UMP | University of Minnesota Press Blog: 'No More Frankens'? How about No More Misleading Facts? 'No More Frankens'? How about No More Misleading Facts? 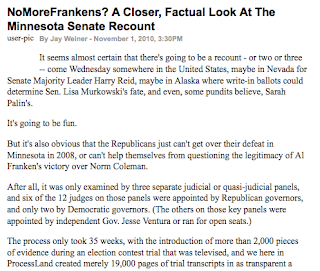 Reporter Jay Weiner, who covered just about every day of litigation in the 2008 Franken–Coleman Minnesota Senate recount, points out flaws on NoMoreFrankens.com. The Washington Independent drills down a few of the facts. Find out more at www.ThisIsNotFlorida.com.